Home Uncategorized Took the Weekend Off! Ok, not entirely. I did get some work done but more importantly we went to the Grand Prix of St. Pete and met a lot of great people there. We were guests of Andretti Autosport and ExactTarget and both companies are tremendous professionals. We arrived around 9:30 for breakfast in Andretti’s hospitality area. From there we got to tour the garage where Marco Andretti’s and Ryan Hunter-Reay’s cars were being worked on. As we were getting the tour the team pulled Marco’s transmission in about five minutes. That alone was impressive. How they could work with us within inches of us I still can’t figure out. But as some of the Andretti crew said, “If it weren’t for the fans, we’d have no jobs.” We also got a tour of the motor homes used to work on the cars. Everything was spotless, the cars, the garage, the motor homes, everything. We headed back for lunch where I bumped into @prebynski and @MitchNeff, great seeing you guys. Around 12:15 we headed over to pit-lane to see Marco’s, Ryan’s and Danica’s cars as they were being rolled out for the start. A lot of work to get these cars to the start of the race, how the teams make this happen with us getting in the way all the time is exceptional. For the start of the race we were sitting almost on the start-finish line. It was tough to tell what happened at turn one but there was a collective sigh of relief when Marco walked away from the Venom car after it was flipped over. One-hundred laps later and it was over. 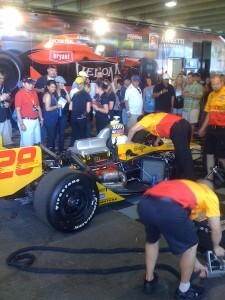 We enjoyed every minute of it and we really appreciate the hospitality of the Andretti Autosport team. I especially want to thank the ExactTarget team of Tim Kopp and Brian Tomey for inviting us to a great weekend.